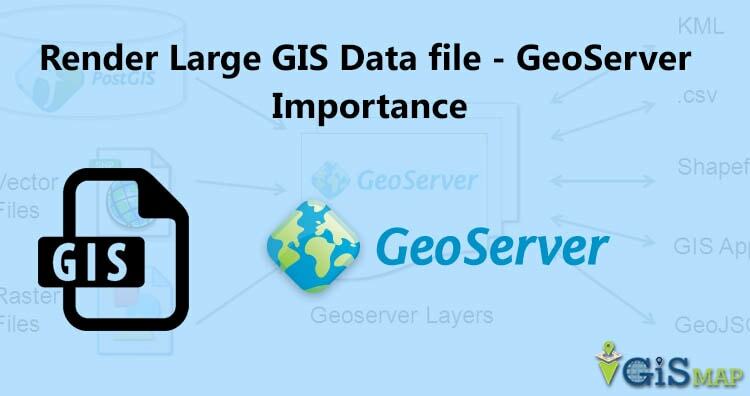 Render Large GIS Data file on Web | GeoServer Importance. For producing any detail map, we need to have large detailed dataset. If it is about country level or world level analysis data it may create huge problems with huge dataset. It can hang your system or slow down it if not used properly. Even for browser it is dangerous because browser takes time or get in not responding mode. More than this you want to change or query data with rendering it on map, this will take much of your precise time. Here is what we are going to discuss how should we avoid rendering the large vector layer from leaflet js or any other library in browser and instead, look for the server side tile to render the same as like GeoServer. To solve this problem we use some servers which can handle the dataset and provide us when required. For the map data we have one the great solution that is geoserver. What is geoserver and how it is helping us? geoserver is an open-source server written in Java that allows users to share, process and edit geospatial data. It helps us to display the information to the world. It has a great feature that using WMS standards it provides variety for output format. It is the Web Map Service Interface Standard (WMS) provides a simple HTTP interface for requesting Geo-registered map images from one or more distributed geospatial databases. A WMS request defines the geographic layers and area of interest to be processed. The response to the request is one or more Geo-registered map images (returned as JPEG, PNG, etc) that can be displayed in a browser application. The interface also supports the ability to specify whether the returned images should be transparent so that layers from multiple servers can be combined or not. Using this with leaflet or Openlayer we can easily create beautiful and interactive maps. It also uses WFS standards, which gives us permission to actually edit and share the data to generate maps. This is also integrating with some popular API such as Google Maps, Google Earth, Yahoo Maps, and Microsoft Virtual Earth. In addition, GeoServer can connect with traditional GIS architectures such as ESRI ArcGIS. Now you might be thinking how geoserver is handling this much of data. Lets explore this topic next. If you are just starting with Geoserver, then you look for install geoserver in windows or install geoserver in ubuntu system. Looking for further web development with geoserver then you can check out other articles too i.e GIS Web Development with geoserver, leaflet and postgis, publish GIS data with api in geoserver, styling raster data and vector data style and other operation like split polygon with WFS in Geoserver. The reason is OCFS2 (Oracle Cluster File System 2) , which is a free, open source, general-purpose, extent-based clustered file system which Oracle developed and contributed to the Linux community, and accepted into Linux kernel 2.6.16. Building on Oracle’s long-term commitment to the Linux and open source community, OCFS2 provides an open source, enterprise-class alternative to proprietary cluster file systems, and provides both high performance and high availability. Cluster- aware applications can leverage cache-coherent parallel I/O for higher performance, and other applications can make use of the file system to provide a fail-over setup to increase availability. Other than this geoserver is having 16 GB memory and geoWebCache has 16 to 32 GB memory. One of reason for high speed performance of geoserver is GeoWebCache. As when new maps with vector data and raster data as tiles are requested, GeoWebCache intercepts these calls and returns pre-rendered tiles if stored, or calls the server to render new tiles as necessary. Thus, once tiles are stored, the speed of map rendering increases by many times. This way you should use GeoServer or any other Server side Tools or Software to render Large GIS Data file on Web. I hope you find this article helpful the importance of GeoServer. If you have any suggestions or questions to ask, do comment below. Thanks.